The Arrowsmith Program’s purpose is to address specific learning difficulties through strenuous written, visual, auditory, computer and cognitive exercises, or brain training. Just this year, the Australian Education Union (AEU) hosted an event promoting the Arrowsmith program and published a four-page spread devoted to its heroic enterprise. The AEU magazine, in which the article is published, is widely read in education circles, sure to be placed by the biscuit tin in staffrooms for educators to pick up and have a read with their cup of tea at recess. The spread is appropriately glossy – full of stories of triumph and allusions to research backing the approach. Quite convincing to the untrained eye. There is only one problem and a major one at that. There are zero independent studies endorsing the Arrowsmith Program as an intervention for students with specific learning difficulties. Despite its promotion by a very powerful organisation in a widely read magazine, Arrowsmith is nothing more than one of many non-evidence based fads aimed at the most vulnerable of students. Teachers are constantly bombarded with programs of this type; they promise much for our students but have little to no evidence of effectiveness (and often with a high price tag to boot). It’s hard to know who to believe when we educators are sold shiny programs for vulnerable students by snake oil merchants over and over again. That’s why a go-to guide like Making Sense of Interventions for Children with Developmental Disorders: A guide for parents and professionals is a welcome addition in this space. The book is comprehensive. 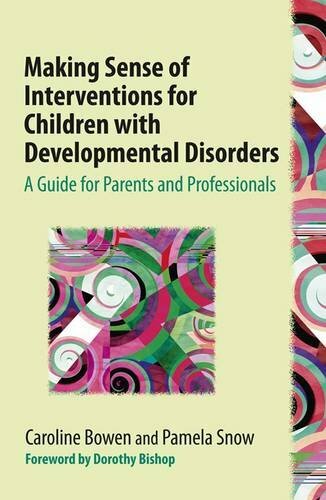 It covers developmental disorders common to the classroom (and beyond it) and gives a succinct appraisal of interventions and approaches commonly sold to – sometimes desperate – educators and parents. Make no mistake, this book is driven by evidence. There are no favours made. All interventions and approaches are evaluated fairly in light of what we know. Some are praised for their robust evidence base, others are challenged to provide more evidence of effectiveness, and the rest are appropriately condemned for their swindling. Pamela Snow and Caroline Bowen don’t have many kind things to say about the Arrowsmith Program, nor other high profile suspects in this space – Braingym, learning styles, Reading Recovery, FastForword, to name a few. They note that the scientific evidence for these approaches is scarce. The authors do not stop here though, going much further to include interventions less well known. Indeed, I myself stumbled upon many interventions and approaches I was much less familiar with yet intrigued by. Take Cellfield, for example, an Australian computer-based approach to remediating reading difficulties that claims to benefit cognition, attention, working memory, and auditory and visual processing (how very promising). Or perhaps psychological astrology, which apparently can help us understand the inner world of those with autism spectrum disorder. Words fail the authors here, and I must say they fail me too. The authors are clearly passionate about ensuring parents and professionals have access to quality, unambiguous information in this space. The book’s topics are taken appropriately seriously, but the authors manage to avoid the sometimes stale delivery of academic texts to provide an accessible and enjoyable read. This is a book worth putting on the shelf to refer to the next time you sit down with your cup of tea and pick up those magazines on the staffroom table. Whether it be Arrowsmith, psychological astrology or cows jumping over the moon, this book is here to help you navigate the minefields and discover the goldfields for helping students who truly need it most. Next Post Should we teach children to be grateful?